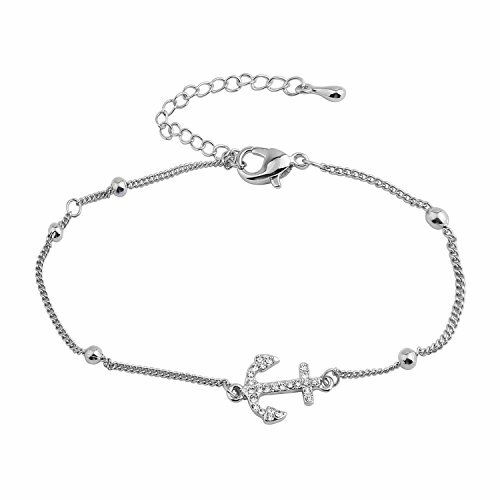 The anchor anklet/bracelet is made of alloy, feturing a sideways anchor charm. One of the most important meanings of anchor is linked to the emotional level. This symbolism also translates to our relationships: the anchor being the bond that unites us to our loved ones, holding us close. Meaning the important one is always there for you, even though you can't see them sometimes. The anchor anklet/bracelet will remind you that you are never alone in this world. Wear this adorable anchor anklet/bracelet this Summer to the beach. Material: Alloy, it is lead free and nickel free. Size: anchor charm: 2cm(0.79inch)*1.4cm(0.55inch), chain length: 18cm(7.09inch)+6cm(2.36inch). The anchor anklet/bracelet will arrive in a velvet bag ready for giving. Perfect for your wife, girlfriend, daughter, sister, mother, friends, or just for yourself. Suitable for Beach, Holiday, Vacation, Wedding, Party, Birthday, Valentine's Day, Anniversary, Mother's Day. Just in time for the summer. The lovely sideways anchor anklet is a classic summer look, especially with a new pair of sandals. Be happy to show off your legs when you wear this ankle jewelry. Anchor plays an important part in sailing. It is a powerful symbol of stability and hope. Perfect for an important one, let the special woman know how important she is to you with this anchor anklet/bracelet.